While you might feel like we just came off a game day weekend, cause we did, I’m headed straight in to this week’s game day right away to get National Tailgate Weekend started! Hallmark may have Valentine’s Day, but College Football has National Tailgate Weekend and I’m here to help you get ready for the sport’s newest holiday! To help celebrate the weekend, and in partnership with Learfield Licensing, I’m sharing three way to style your game day attire for National Tailgate Weekend. The most important piece to a successful National Tailgate Weekend involves tailgating and of course, what you wear. With fall in full swing, it’s hard to nail down a look that you can wear for the cool football mornings and the hot afternoons for kick-off! What I love most about this look is that is manages both of those things and makes for the best National Tailgate Weekend look! 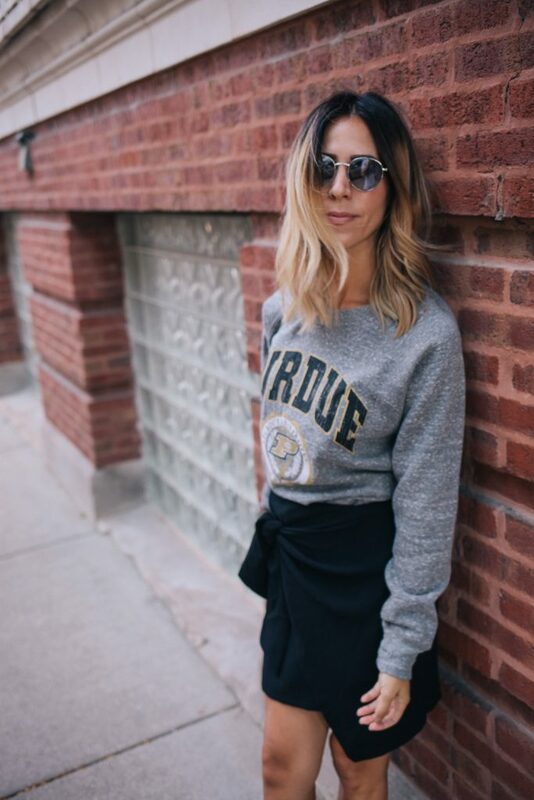 This Purdue University crew neck sweatshirt, makes me re-think every bad thought I have about sweatshirts. The vintage look and feel always wins instant points with me, but I love that it has length to it so that it can styled several different ways. For those cool brisk fall mornings, I styled the sweatshirt with this adorable faux wrap skirt from the Who What Wear Target collection. I’m obsessed with the entire Who What Wear collection – that combined with this new trend of the wrap skirt, I was sold! Comfort is key on a game day and there is no point in putting your feel through the pain of wearing heels at a concrete stadium. These Nike x A.L.C. sneakers are what sports + fashion dreams are made of – the reboot of this Nike style (Cortez) is the perfect addition to your sneaker wardrobe. The best part? The laces are made longer to wrap up your leg for an edgier affect! Need help putting together your own tailgate? Check out my post here on building a tailgate in the trunk of your car! Boom! Game day fashion shouldn’t always be limited to game days – you should have the freedom to wear your game day gear on any day of the week to anywhere you like! Right? For this look, I’m taking my game day look straight out to a girls night out – why not? Oversized anything is extremely on trend at the moment and we are all craving anything plaid this fall. 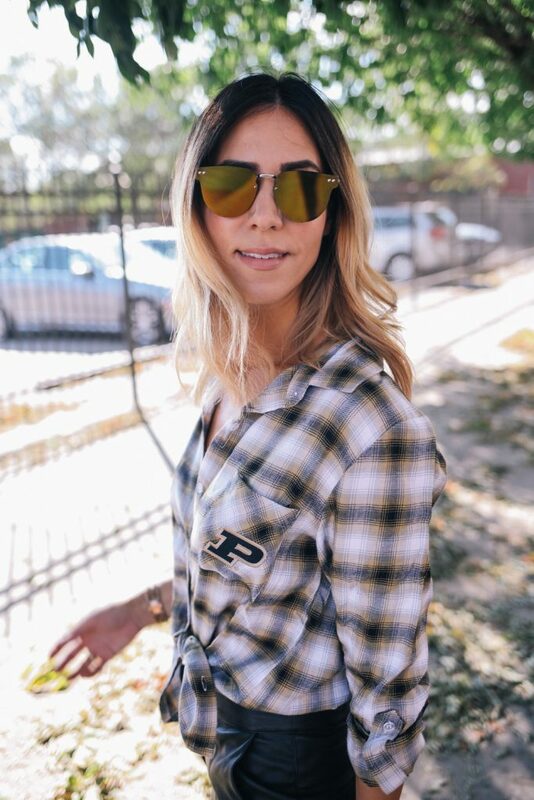 This plaid oversized Purdue University game day flannel is one of those fantastic convertible pieces you can to just about anything in your every day. For my girls night out look, I’ve style this flannel top with these AMAZING vegan cropped leather pants from H&M. Ok, I so I bought these online with little expectation. When they arrived I was floored that for $34.99 these pants not only look like real leather, but feel like it too – they are the biggest bargain buy ever friends. Now quit wasting your time and go buy them….seriously. 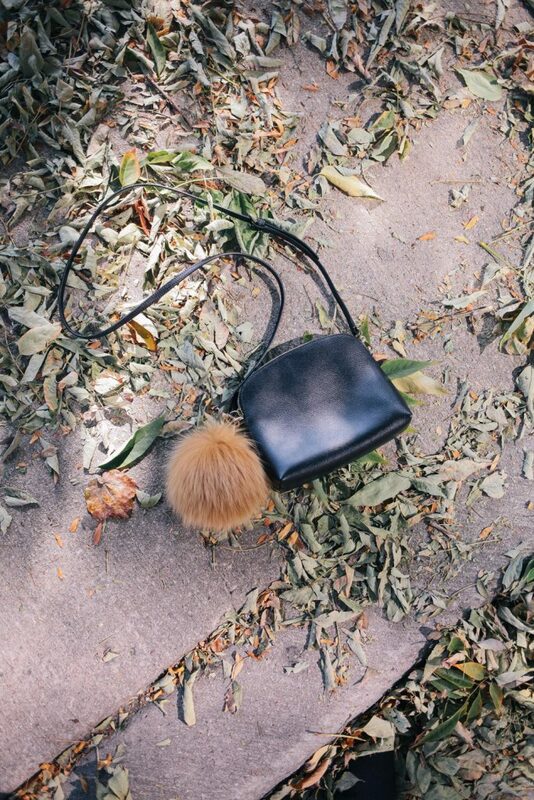 With my girls night out in mind, I need some accessories to really amp up my look! These fabric style boots from Zara are my best friends this fall – I stalked them like a crazy person until I found a store that had them in stock. For $59.99 I will do that. I love how they hug your foot and mini a sock – they are so sleek and fit so well under a cropped pant. For my last look, I’ve focused on something that we all do in our every day and arguably, the easiest way you can incorporate game day in to your every day…working out! I’m all about incorporate game day in to ever facet of my life! 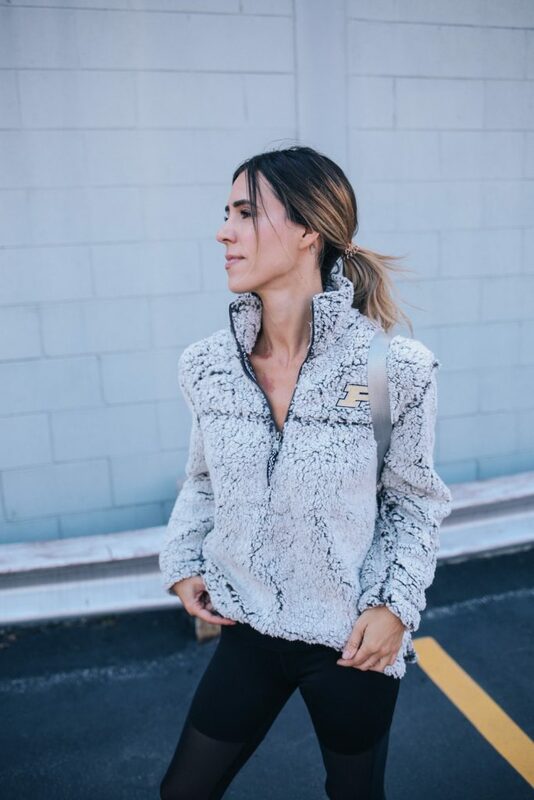 This COZY plush fleece sweater is a MUST – it’s great for outdoor workouts and is perfect for those cold games! When shopping for workout pants, I’m always attracted to the stores where I know I’ll get a deal – who wants to pay $100 for a pair of workouts pants. Um not me – girls gotta eat! The pants I’m wearing in the post are from T.J. Maxx, but these are from Amazon and are under $10. Shop the entire look below. Post sponsored by Learfield Licensing. I simply want to mention I am just very new to blogs and really loved your web-site. Almost certainly I’m planning to bookmark your blog . You absolutely come with outstanding articles. Kudos for revealing your website. Hi there. I found your site by the use of Google whilst searching for a comparable subject, your website got here up. It seems great. I have bookmarked it in my google bookmarks to come back then. Hi there. I discovered your site via Google at the same time as searching for a similar matter, your website came up. It seems good. I’ve bookmarked it in my google bookmarks to visit then. Hiya, I am really glad I’ve found this info. Today bloggers publish only about gossip and web stuff and this is actually irritating. A good web site with exciting content, that’s what I need. Thanks for making this website, and I’ll be visiting again. Do you do newsletters by email? Hiya, I’m really glad I’ve found this information. Today bloggers publish only about gossip and net stuff and this is really frustrating. A good blog with exciting content, this is what I need. Thanks for making this web site, and I’ll be visiting again. Do you do newsletters by email? Hi there. I discovered your blog by means of Google even as looking for a comparable matter, your website got here up. It seems to be good. I have bookmarked it in my google bookmarks to come back then. Hiya, I’m really glad I’ve found this information. Nowadays bloggers publish only about gossip and internet stuff and this is really frustrating. A good blog with exciting content, this is what I need. Thanks for making this site, and I will be visiting again. Do you do newsletters by email? Hiya, I’m really glad I have found this info. Today bloggers publish just about gossip and internet stuff and this is actually irritating. A good web site with interesting content, that is what I need. Thanks for making this site, and I’ll be visiting again. Do you do newsletters by email? Hey there. I found your blog by means of Google at the same time as looking for a similar matter, your site got here up. It looks good. I have bookmarked it in my google bookmarks to visit then. Hiya, I’m really glad I have found this info. Nowadays bloggers publish just about gossip and web stuff and this is really frustrating. A good website with interesting content, this is what I need. Thanks for making this website, and I will be visiting again. Do you do newsletters by email? Hello there. I found your site by the use of Google while looking for a related matter, your web site got here up. It looks great. I have bookmarked it in my google bookmarks to visit then. Hello there. I discovered your blog by way of Google while looking for a related matter, your web site got here up. It seems good. I’ve bookmarked it in my google bookmarks to visit then. Hey there. I found your web site by the use of Google even as searching for a similar topic, your web site got here up. It seems to be great. I’ve bookmarked it in my google bookmarks to come back then. Hiya, I am really glad I have found this information. Nowadays bloggers publish just about gossip and internet stuff and this is really annoying. A good blog with exciting content, this is what I need. Thanks for making this web-site, and I will be visiting again. Do you do newsletters by email? Hello there. I found your blog via Google whilst looking for a related subject, your web site came up. It looks good. I’ve bookmarked it in my google bookmarks to come back then. Hiya, I’m really glad I have found this information. Today bloggers publish only about gossip and web stuff and this is really frustrating. A good site with exciting content, this is what I need. Thank you for making this web site, and I’ll be visiting again. Do you do newsletters by email? Hiya, I’m really glad I’ve found this info. Nowadays bloggers publish just about gossip and net stuff and this is really frustrating. A good website with exciting content, that is what I need. Thank you for making this website, and I will be visiting again. Do you do newsletters by email? Hiya, I am really glad I have found this information. Today bloggers publish only about gossip and internet stuff and this is actually irritating. A good web site with interesting content, this is what I need. Thanks for making this site, and I will be visiting again. Do you do newsletters by email? Hi there. I discovered your blog by the use of Google even as looking for a related matter, your site came up. It appears to be good. I’ve bookmarked it in my google bookmarks to come back then. Hi there. I found your website by way of Google while looking for a similar subject, your web site came up. It appears to be great. I have bookmarked it in my google bookmarks to come back then. Hi there. I discovered your blog via Google while looking for a similar topic, your site got here up. It seems good. I’ve bookmarked it in my google bookmarks to visit then. Hiya, I’m really glad I have found this info. Nowadays bloggers publish only about gossip and web stuff and this is really frustrating. A good website with interesting content, this is what I need. Thanks for making this web site, and I’ll be visiting again. Do you do newsletters by email? Hey there. I discovered your blog by way of Google at the same time as looking for a comparable topic, your web site got here up. It seems to be great. I have bookmarked it in my google bookmarks to come back then. Hiya, I am really glad I have found this information. Today bloggers publish only about gossip and web stuff and this is actually annoying. A good site with interesting content, this is what I need. Thank you for making this site, and I’ll be visiting again. Do you do newsletters by email? Hello there. I found your blog by way of Google even as searching for a similar matter, your web site came up. It appears to be good. I’ve bookmarked it in my google bookmarks to come back then. Hey there. I discovered your site by means of Google even as looking for a comparable matter, your web site came up. It seems to be great. I have bookmarked it in my google bookmarks to come back then. Hiya, I am really glad I’ve found this info. Nowadays bloggers publish just about gossip and web stuff and this is really annoying. A good web site with exciting content, that is what I need. Thanks for making this web site, and I will be visiting again. Do you do newsletters by email? Hey there. I discovered your site by the use of Google even as searching for a comparable subject, your site came up. It looks great. I have bookmarked it in my google bookmarks to visit then. Hi there. I found your website by way of Google while looking for a related subject, your website came up. It seems to be great. I’ve bookmarked it in my google bookmarks to visit then. Hey there. I discovered your website via Google even as looking for a related subject, your site got here up. It seems good. I’ve bookmarked it in my google bookmarks to visit then. Hiya, I’m really glad I’ve found this info. Today bloggers publish only about gossip and web stuff and this is actually annoying. A good site with interesting content, that’s what I need. Thanks for making this web site, and I will be visiting again. Do you do newsletters by email? Hi there. I discovered your blog by the use of Google whilst looking for a comparable subject, your website came up. It appears to be good. I have bookmarked it in my google bookmarks to come back then. Hello there. I found your website by way of Google while searching for a related subject, your site got here up. It appears good. I’ve bookmarked it in my google bookmarks to visit then. Hiya, I am really glad I’ve found this information. Nowadays bloggers publish only about gossip and net stuff and this is really irritating. A good web site with interesting content, this is what I need. Thank you for making this web site, and I will be visiting again. Do you do newsletters by email? Hiya, I’m really glad I have found this info. Nowadays bloggers publish just about gossip and net stuff and this is really irritating. A good web site with exciting content, this is what I need. Thanks for making this website, and I will be visiting again. Do you do newsletters by email? Hiya, I am really glad I have found this info. Today bloggers publish just about gossip and internet stuff and this is really annoying. A good blog with exciting content, this is what I need. Thank you for making this site, and I will be visiting again. Do you do newsletters by email? Hello there. I found your blog via Google even as searching for a comparable subject, your site got here up. It looks good. I have bookmarked it in my google bookmarks to come back then. Hiya, I’m really glad I’ve found this information. Nowadays bloggers publish just about gossip and web stuff and this is really annoying. A good site with interesting content, this is what I need. Thank you for making this website, and I’ll be visiting again. Do you do newsletters by email? Hey there. I found your website by way of Google even as looking for a comparable subject, your site got here up. It appears great. I’ve bookmarked it in my google bookmarks to come back then. Hiya, I am really glad I have found this info. Nowadays bloggers publish only about gossip and net stuff and this is actually frustrating. A good web site with interesting content, this is what I need. Thanks for making this web site, and I will be visiting again. Do you do newsletters by email? Hiya, I’m really glad I have found this information. Today bloggers publish just about gossip and web stuff and this is actually frustrating. A good web site with exciting content, that is what I need. Thank you for making this site, and I will be visiting again. Do you do newsletters by email? Hiya, I am really glad I’ve found this info. Today bloggers publish just about gossip and internet stuff and this is actually annoying. A good blog with exciting content, this is what I need. Thank you for making this web site, and I will be visiting again. Do you do newsletters by email? Hello there. I discovered your blog by way of Google whilst looking for a related subject, your web site came up. It appears to be good. I’ve bookmarked it in my google bookmarks to visit then. Hiya, I’m really glad I’ve found this info. Nowadays bloggers publish only about gossip and web stuff and this is actually annoying. A good web site with exciting content, this is what I need. Thanks for making this site, and I will be visiting again. Do you do newsletters by email? Hi there. I found your web site by the use of Google while looking for a comparable matter, your website came up. It appears good. I have bookmarked it in my google bookmarks to visit then. Hiya, I am really glad I have found this info. Nowadays bloggers publish only about gossip and net stuff and this is really irritating. A good website with interesting content, that is what I need. Thank you for making this web site, and I will be visiting again. Do you do newsletters by email? Hiya, I am really glad I’ve found this information. Nowadays bloggers publish just about gossip and web stuff and this is really irritating. A good site with interesting content, that’s what I need. Thanks for making this site, and I will be visiting again. Do you do newsletters by email? Hiya, I’m really glad I’ve found this info. Nowadays bloggers publish just about gossip and web stuff and this is actually irritating. A good website with interesting content, that’s what I need. Thank you for making this site, and I will be visiting again. Do you do newsletters by email? Hiya, I am really glad I have found this information. Nowadays bloggers publish just about gossip and web stuff and this is actually annoying. A good website with exciting content, this is what I need. Thank you for making this site, and I will be visiting again. Do you do newsletters by email? Hi there. I discovered your web site by the use of Google while searching for a similar subject, your web site came up. It appears to be good. I’ve bookmarked it in my google bookmarks to visit then. Hiya, I am really glad I’ve found this information. Nowadays bloggers publish only about gossip and net stuff and this is actually irritating. A good blog with exciting content, that’s what I need. Thank you for making this web site, and I will be visiting again. Do you do newsletters by email? Hiya, I’m really glad I’ve found this information. Nowadays bloggers publish only about gossip and net stuff and this is really irritating. A good site with interesting content, this is what I need. Thank you for making this website, and I will be visiting again. Do you do newsletters by email? Hiya, I am really glad I have found this information. Nowadays bloggers publish only about gossip and net stuff and this is actually irritating. A good site with interesting content, that is what I need. Thank you for making this website, and I’ll be visiting again. Do you do newsletters by email? Hey there. I found your blog by means of Google even as searching for a comparable topic, your web site got here up. It appears to be great. I’ve bookmarked it in my google bookmarks to come back then. Hiya, I’m really glad I’ve found this information. Nowadays bloggers publish just about gossip and net stuff and this is really irritating. A good website with interesting content, this is what I need. Thanks for making this web-site, and I’ll be visiting again. Do you do newsletters by email? Hey there. I found your blog via Google at the same time as looking for a related topic, your website got here up. It seems to be good. I have bookmarked it in my google bookmarks to come back then. Hiya, I’m really glad I’ve found this information. Today bloggers publish just about gossip and net stuff and this is actually frustrating. A good blog with interesting content, this is what I need. Thank you for making this web-site, and I’ll be visiting again. Do you do newsletters by email? Hi there. I found your web site by means of Google while searching for a related topic, your site got here up. It appears great. I have bookmarked it in my google bookmarks to come back then. Hiya, I am really glad I’ve found this info. Today bloggers publish only about gossip and internet stuff and this is really irritating. A good blog with exciting content, this is what I need. Thank you for making this site, and I’ll be visiting again. Do you do newsletters by email? Hey there. I found your site via Google whilst searching for a similar matter, your web site came up. It seems to be good. I have bookmarked it in my google bookmarks to visit then. Hiya, I am really glad I have found this information. Nowadays bloggers publish just about gossip and net stuff and this is actually annoying. A good blog with interesting content, that’s what I need. Thank you for making this web site, and I’ll be visiting again. Do you do newsletters by email? Hiya, I’m really glad I have found this information. Today bloggers publish just about gossip and internet stuff and this is really annoying. A good blog with exciting content, that’s what I need. Thank you for making this web site, and I will be visiting again. Do you do newsletters by email? Hiya, I am really glad I have found this information. Nowadays bloggers publish just about gossip and web stuff and this is really frustrating. A good blog with exciting content, this is what I need. Thanks for making this web site, and I’ll be visiting again. Do you do newsletters by email? Hiya, I am really glad I have found this info. Nowadays bloggers publish just about gossip and web stuff and this is actually annoying. A good website with exciting content, this is what I need. Thanks for making this website, and I will be visiting again. Do you do newsletters by email? Hiya, I’m really glad I’ve found this info. Nowadays bloggers publish only about gossip and net stuff and this is actually annoying. A good site with interesting content, this is what I need. Thanks for making this site, and I will be visiting again. Do you do newsletters by email? Hi there. I discovered your site by means of Google while searching for a related matter, your website got here up. It appears good. I have bookmarked it in my google bookmarks to come back then. Hello there. I found your website by the use of Google whilst searching for a related topic, your site got here up. It looks great. I’ve bookmarked it in my google bookmarks to come back then. Hi there. I discovered your website by way of Google even as searching for a related subject, your site got here up. It seems good. I have bookmarked it in my google bookmarks to visit then. Hiya, I’m really glad I have found this info. Today bloggers publish just about gossip and web stuff and this is really annoying. A good web site with interesting content, this is what I need. Thanks for making this website, and I will be visiting again. Do you do newsletters by email? Hey there. I discovered your blog via Google at the same time as looking for a comparable topic, your website got here up. It seems great. I’ve bookmarked it in my google bookmarks to come back then. Hiya, I am really glad I have found this info. Nowadays bloggers publish just about gossip and internet stuff and this is really irritating. A good blog with exciting content, this is what I need. Thank you for making this web-site, and I will be visiting again. Do you do newsletters by email? Hiya, I am really glad I have found this info. Today bloggers publish only about gossip and web stuff and this is really irritating. A good web site with exciting content, this is what I need. Thanks for making this web-site, and I will be visiting again. Do you do newsletters by email? Hiya, I’m really glad I’ve found this information. Today bloggers publish only about gossip and web stuff and this is actually frustrating. A good site with interesting content, this is what I need. Thank you for making this web-site, and I’ll be visiting again. Do you do newsletters by email? Hey there. I found your blog by the use of Google whilst looking for a related matter, your site came up. It appears great. I’ve bookmarked it in my google bookmarks to visit then. Hiya, I’m really glad I have found this information. Nowadays bloggers publish just about gossip and internet stuff and this is actually irritating. A good blog with interesting content, this is what I need. Thank you for making this website, and I’ll be visiting again. Do you do newsletters by email? Hiya, I’m really glad I have found this information. Nowadays bloggers publish only about gossip and web stuff and this is really annoying. A good blog with interesting content, that is what I need. Thanks for making this web site, and I will be visiting again. Do you do newsletters by email? Hey there. I discovered your website by way of Google whilst searching for a similar topic, your site got here up. It seems great. I have bookmarked it in my google bookmarks to visit then. Hey there. I discovered your web site via Google at the same time as searching for a similar matter, your web site came up. It seems to be good. I have bookmarked it in my google bookmarks to come back then. Hi there. I found your site by way of Google at the same time as looking for a similar subject, your web site got here up. It seems to be good. I’ve bookmarked it in my google bookmarks to visit then. Hiya, I’m really glad I have found this information. Today bloggers publish only about gossip and internet stuff and this is really irritating. A good website with interesting content, this is what I need. Thank you for making this website, and I will be visiting again. Do you do newsletters by email? Hello there. I found your web site by the use of Google at the same time as searching for a comparable topic, your website came up. It seems good. I have bookmarked it in my google bookmarks to come back then. Hey there. I found your web site by way of Google even as looking for a comparable topic, your web site got here up. It appears to be good. I have bookmarked it in my google bookmarks to come back then. Hello there. I discovered your site by way of Google even as looking for a related matter, your web site got here up. It appears to be great. I have bookmarked it in my google bookmarks to visit then. Hello there. I discovered your website via Google while searching for a similar subject, your website got here up. It appears to be good. I have bookmarked it in my google bookmarks to come back then. Hiya, I’m really glad I have found this info. Today bloggers publish just about gossip and web stuff and this is actually frustrating. A good web site with interesting content, that’s what I need. Thanks for making this website, and I’ll be visiting again. Do you do newsletters by email? Hiya, I am really glad I’ve found this info. Nowadays bloggers publish just about gossip and net stuff and this is actually annoying. A good website with exciting content, that’s what I need. Thanks for making this website, and I will be visiting again. Do you do newsletters by email? Hiya, I am really glad I’ve found this info. Today bloggers publish only about gossip and web stuff and this is really frustrating. A good web site with exciting content, this is what I need. Thanks for making this web-site, and I will be visiting again. Do you do newsletters by email? Hiya, I am really glad I’ve found this information. Nowadays bloggers publish just about gossip and web stuff and this is really frustrating. A good blog with interesting content, that is what I need. Thanks for making this site, and I’ll be visiting again. Do you do newsletters by email? Hi there. I discovered your web site by the use of Google while searching for a related topic, your site came up. It seems to be great. I’ve bookmarked it in my google bookmarks to come back then. Hiya, I’m really glad I’ve found this info. Today bloggers publish only about gossip and web stuff and this is really annoying. A good web site with interesting content, that’s what I need. Thanks for making this site, and I will be visiting again. Do you do newsletters by email? Hi there. I discovered your website by way of Google whilst looking for a comparable subject, your website got here up. It seems to be good. I have bookmarked it in my google bookmarks to come back then. Hi there. I found your blog via Google at the same time as looking for a comparable subject, your website came up. It seems great. I’ve bookmarked it in my google bookmarks to come back then. Hello there. I found your site by means of Google at the same time as searching for a similar subject, your web site got here up. It appears to be great. I have bookmarked it in my google bookmarks to visit then. Hiya, I’m really glad I’ve found this information. Nowadays bloggers publish just about gossip and web stuff and this is really irritating. A good site with exciting content, this is what I need. Thanks for making this web-site, and I will be visiting again. Do you do newsletters by email? Hiya, I’m really glad I’ve found this information. Nowadays bloggers publish only about gossip and internet stuff and this is actually annoying. A good blog with interesting content, this is what I need. Thank you for making this web-site, and I’ll be visiting again. Do you do newsletters by email? Hiya, I’m really glad I have found this information. Today bloggers publish only about gossip and net stuff and this is really annoying. A good site with exciting content, this is what I need. Thanks for making this website, and I will be visiting again. Do you do newsletters by email? Hello there. I discovered your site via Google at the same time as searching for a comparable subject, your website got here up. It seems good. I’ve bookmarked it in my google bookmarks to come back then. Hey there. I found your blog by the use of Google at the same time as looking for a comparable topic, your web site came up. It seems to be good. I’ve bookmarked it in my google bookmarks to come back then. Hey there. I found your blog by means of Google whilst looking for a related subject, your web site got here up. It appears great. I’ve bookmarked it in my google bookmarks to come back then. Hiya, I’m really glad I have found this information. Today bloggers publish only about gossip and internet stuff and this is really frustrating. A good website with exciting content, this is what I need. Thank you for making this web-site, and I’ll be visiting again. Do you do newsletters by email? Hello there. I found your site by the use of Google while searching for a comparable topic, your website got here up. It seems great. I have bookmarked it in my google bookmarks to visit then. Hiya, I am really glad I have found this information. Today bloggers publish only about gossip and web stuff and this is actually irritating. A good website with interesting content, that is what I need. Thank you for making this site, and I’ll be visiting again. Do you do newsletters by email? Hello there. I discovered your site via Google while looking for a similar matter, your website got here up. It seems to be good. I have bookmarked it in my google bookmarks to visit then. Hiya, I’m really glad I’ve found this information. Today bloggers publish just about gossip and internet stuff and this is actually frustrating. A good site with interesting content, this is what I need. Thank you for making this web site, and I will be visiting again. Do you do newsletters by email? Hiya, I’m really glad I have found this information. Today bloggers publish only about gossip and net stuff and this is really annoying. A good website with interesting content, this is what I need. Thanks for making this web site, and I’ll be visiting again. Do you do newsletters by email? Hiya, I am really glad I’ve found this info. Today bloggers publish just about gossip and net stuff and this is really irritating. A good site with interesting content, that is what I need. Thanks for making this web site, and I will be visiting again. Do you do newsletters by email? Hello there. I discovered your site by the use of Google at the same time as searching for a related topic, your web site came up. It appears good. I’ve bookmarked it in my google bookmarks to come back then. Hiya, I am really glad I have found this information. Today bloggers publish just about gossip and internet stuff and this is actually annoying. A good site with interesting content, this is what I need. Thank you for making this site, and I will be visiting again. Do you do newsletters by email? Hi there. I discovered your website by means of Google while searching for a related matter, your site came up. It looks good. I have bookmarked it in my google bookmarks to come back then. Hiya, I’m really glad I have found this information. Nowadays bloggers publish just about gossip and net stuff and this is really frustrating. A good web site with interesting content, that is what I need. Thank you for making this web site, and I’ll be visiting again. Do you do newsletters by email? Hi there. I discovered your web site by the use of Google at the same time as looking for a comparable matter, your website got here up. It appears good. I have bookmarked it in my google bookmarks to come back then. Hiya, I am really glad I have found this information. Today bloggers publish only about gossip and net stuff and this is actually irritating. A good web site with interesting content, that’s what I need. Thanks for making this web-site, and I will be visiting again. Do you do newsletters by email? Hi there. I found your site by means of Google while looking for a comparable topic, your web site got here up. It looks good. I’ve bookmarked it in my google bookmarks to visit then. Hiya, I’m really glad I’ve found this info. Today bloggers publish just about gossip and net stuff and this is really frustrating. A good site with exciting content, that’s what I need. Thank you for making this website, and I’ll be visiting again. Do you do newsletters by email? Hello there. I found your blog via Google at the same time as searching for a related matter, your site came up. It appears great. I have bookmarked it in my google bookmarks to visit then. Hiya, I am really glad I have found this information. Nowadays bloggers publish just about gossip and internet stuff and this is really irritating. A good site with exciting content, this is what I need. Thanks for making this web-site, and I will be visiting again. Do you do newsletters by email? Hiya, I am really glad I have found this information. Nowadays bloggers publish just about gossip and net stuff and this is really frustrating. A good site with interesting content, that’s what I need. Thank you for making this web-site, and I’ll be visiting again. Do you do newsletters by email? Hey there. I discovered your site by means of Google while looking for a related topic, your site got here up. It seems to be great. I’ve bookmarked it in my google bookmarks to visit then. Hiya, I’m really glad I have found this info. Nowadays bloggers publish just about gossip and internet stuff and this is really irritating. A good site with exciting content, this is what I need. Thanks for making this site, and I will be visiting again. Do you do newsletters by email? Hi there. I found your site by way of Google even as looking for a comparable subject, your web site got here up. It looks great. I have bookmarked it in my google bookmarks to come back then. Hey there. I found your web site via Google at the same time as looking for a comparable subject, your website came up. It seems good. I have bookmarked it in my google bookmarks to visit then. Hello there. I found your blog by way of Google while looking for a similar subject, your web site came up. It looks great. I have bookmarked it in my google bookmarks to visit then. Hiya, I am really glad I’ve found this info. Today bloggers publish just about gossip and internet stuff and this is actually frustrating. A good site with exciting content, this is what I need. Thank you for making this website, and I will be visiting again. Do you do newsletters by email? Hey there. I found your website by means of Google while looking for a related matter, your web site got here up. It appears good. I have bookmarked it in my google bookmarks to visit then. Hey there. I found your site by way of Google while searching for a related subject, your site came up. It seems good. I’ve bookmarked it in my google bookmarks to come back then. Hey there. I discovered your website by means of Google while looking for a related subject, your web site came up. It appears good. I have bookmarked it in my google bookmarks to visit then. Hey there. I discovered your web site by way of Google even as searching for a comparable topic, your site came up. It appears great. I’ve bookmarked it in my google bookmarks to come back then. Hi there. I discovered your blog by way of Google even as looking for a similar topic, your web site came up. It appears to be great. I have bookmarked it in my google bookmarks to come back then. Hey there. I found your website by the use of Google while searching for a related topic, your site came up. It looks great. I’ve bookmarked it in my google bookmarks to visit then. Hey there. I found your web site by the use of Google at the same time as searching for a comparable topic, your site came up. It appears to be good. I’ve bookmarked it in my google bookmarks to come back then. Hiya, I’m really glad I’ve found this information. Today bloggers publish only about gossip and net stuff and this is really annoying. A good website with exciting content, this is what I need. Thank you for making this web-site, and I’ll be visiting again. Do you do newsletters by email? Hi there. I discovered your blog by means of Google while searching for a comparable topic, your web site came up. It seems great. I’ve bookmarked it in my google bookmarks to visit then. Hello there. I discovered your website via Google at the same time as searching for a similar subject, your website came up. It appears to be good. I have bookmarked it in my google bookmarks to come back then. Hi there. I found your site by way of Google even as looking for a related matter, your website got here up. It looks great. I have bookmarked it in my google bookmarks to come back then. Hiya, I am really glad I have found this info. Nowadays bloggers publish just about gossip and net stuff and this is really irritating. A good website with exciting content, this is what I need. Thank you for making this site, and I’ll be visiting again. Do you do newsletters by email? Hi there. I discovered your website by the use of Google while looking for a comparable subject, your web site came up. It seems good. I’ve bookmarked it in my google bookmarks to visit then. Hi there. I found your web site by means of Google even as searching for a similar matter, your website got here up. It seems good. I’ve bookmarked it in my google bookmarks to visit then. Hi there. I discovered your website by means of Google at the same time as looking for a similar matter, your website got here up. It looks great. I’ve bookmarked it in my google bookmarks to visit then. Hiya, I am really glad I have found this information. Nowadays bloggers publish just about gossip and net stuff and this is really frustrating. A good site with interesting content, that’s what I need. Thank you for making this site, and I will be visiting again. Do you do newsletters by email? Hiya, I’m really glad I’ve found this information. Nowadays bloggers publish just about gossip and internet stuff and this is really irritating. A good site with exciting content, that is what I need. Thank you for making this web site, and I’ll be visiting again. Do you do newsletters by email? Hiya, I’m really glad I’ve found this info. Nowadays bloggers publish just about gossip and net stuff and this is actually annoying. A good web site with interesting content, that’s what I need. Thanks for making this web-site, and I’ll be visiting again. Do you do newsletters by email? Hi there. I found your web site by the use of Google at the same time as searching for a related matter, your web site came up. It seems to be great. I have bookmarked it in my google bookmarks to visit then. Hiya, I’m really glad I’ve found this information. Nowadays bloggers publish only about gossip and internet stuff and this is actually frustrating. A good blog with interesting content, that’s what I need. Thanks for making this website, and I’ll be visiting again. Do you do newsletters by email? Hi there. I discovered your web site via Google whilst looking for a related topic, your site got here up. It appears to be good. I have bookmarked it in my google bookmarks to come back then. Hiya, I am really glad I’ve found this info. Nowadays bloggers publish only about gossip and web stuff and this is really irritating. A good web site with interesting content, this is what I need. Thank you for making this site, and I will be visiting again. Do you do newsletters by email? Hiya, I’m really glad I’ve found this info. Today bloggers publish only about gossip and internet stuff and this is actually annoying. A good blog with interesting content, this is what I need. Thanks for making this web site, and I’ll be visiting again. Do you do newsletters by email? Hiya, I’m really glad I’ve found this information. Today bloggers publish just about gossip and net stuff and this is really frustrating. A good blog with interesting content, this is what I need. Thank you for making this web-site, and I’ll be visiting again. Do you do newsletters by email? Hiya, I am really glad I have found this info. Today bloggers publish just about gossip and web stuff and this is really annoying. A good web site with exciting content, this is what I need. Thanks for making this web-site, and I will be visiting again. Do you do newsletters by email? Hi there. I found your blog by means of Google at the same time as looking for a related matter, your website came up. It seems great. I’ve bookmarked it in my google bookmarks to come back then. Hiya, I am really glad I have found this information. Nowadays bloggers publish just about gossip and internet stuff and this is really irritating. A good web site with interesting content, this is what I need. Thank you for making this web-site, and I will be visiting again. Do you do newsletters by email? Hiya, I’m really glad I’ve found this information. Today bloggers publish only about gossip and net stuff and this is really irritating. A good website with interesting content, that is what I need. Thanks for making this web site, and I’ll be visiting again. Do you do newsletters by email? Hiya, I’m really glad I have found this information. Today bloggers publish only about gossip and web stuff and this is actually annoying. A good site with interesting content, that is what I need. Thanks for making this web-site, and I’ll be visiting again. Do you do newsletters by email? Hello there. I discovered your blog by means of Google even as searching for a related matter, your site came up. It appears great. I have bookmarked it in my google bookmarks to visit then. Hiya, I’m really glad I’ve found this information. Nowadays bloggers publish just about gossip and net stuff and this is really frustrating. A good web site with interesting content, that’s what I need. Thank you for making this site, and I will be visiting again. Do you do newsletters by email? Hiya, I’m really glad I’ve found this info. Today bloggers publish just about gossip and net stuff and this is really annoying. A good website with interesting content, this is what I need. Thanks for making this web site, and I will be visiting again. Do you do newsletters by email? Hiya, I’m really glad I’ve found this information. Today bloggers publish just about gossip and internet stuff and this is actually annoying. A good website with interesting content, that’s what I need. Thank you for making this site, and I’ll be visiting again. Do you do newsletters by email? Hiya, I am really glad I’ve found this info. Nowadays bloggers publish just about gossip and web stuff and this is really annoying. A good website with interesting content, this is what I need. Thank you for making this site, and I’ll be visiting again. Do you do newsletters by email? Hiya, I’m really glad I’ve found this information. Nowadays bloggers publish just about gossip and internet stuff and this is really frustrating. A good website with interesting content, that’s what I need. Thanks for making this web-site, and I’ll be visiting again. Do you do newsletters by email? Hiya, I am really glad I’ve found this info. Nowadays bloggers publish only about gossip and net stuff and this is actually irritating. A good site with interesting content, this is what I need. Thank you for making this web-site, and I will be visiting again. Do you do newsletters by email? Hiya, I am really glad I have found this info. Nowadays bloggers publish only about gossip and web stuff and this is actually frustrating. A good website with interesting content, that’s what I need. Thanks for making this website, and I’ll be visiting again. Do you do newsletters by email? Hiya, I’m really glad I’ve found this information. Today bloggers publish just about gossip and internet stuff and this is really frustrating. A good website with interesting content, that’s what I need. Thank you for making this web-site, and I’ll be visiting again. Do you do newsletters by email? Hey there. I found your website by the use of Google even as searching for a related subject, your web site came up. It looks great. I have bookmarked it in my google bookmarks to visit then. Hi there. I found your website by the use of Google even as searching for a similar matter, your website got here up. It looks good. I’ve bookmarked it in my google bookmarks to come back then. Hiya, I am really glad I have found this information. Nowadays bloggers publish only about gossip and net stuff and this is really frustrating. A good blog with exciting content, that’s what I need. Thank you for making this website, and I will be visiting again. Do you do newsletters by email? Hello there. I found your site by the use of Google even as looking for a related matter, your website got here up. It appears to be good. I have bookmarked it in my google bookmarks to come back then. Hiya, I am really glad I have found this information. Today bloggers publish only about gossip and internet stuff and this is really irritating. A good web site with interesting content, this is what I need. Thank you for making this web site, and I will be visiting again. Do you do newsletters by email? Hello there. I discovered your site by the use of Google whilst looking for a related topic, your website got here up. It seems great. I have bookmarked it in my google bookmarks to come back then. Hello there. I found your website by the use of Google while looking for a related matter, your site came up. It seems good. I’ve bookmarked it in my google bookmarks to come back then. Hi there. I found your website by means of Google at the same time as looking for a comparable matter, your web site came up. It looks good. I’ve bookmarked it in my google bookmarks to visit then. Hiya, I’m really glad I have found this info. Nowadays bloggers publish only about gossip and net stuff and this is actually irritating. A good web site with exciting content, that’s what I need. Thanks for making this web-site, and I’ll be visiting again. Do you do newsletters by email? Hiya, I’m really glad I have found this information. Today bloggers publish just about gossip and internet stuff and this is really frustrating. A good web site with interesting content, that’s what I need. Thanks for making this web site, and I’ll be visiting again. Do you do newsletters by email? Hey there. I discovered your blog by means of Google while looking for a similar topic, your website came up. It looks great. I’ve bookmarked it in my google bookmarks to visit then. Hiya, I’m really glad I have found this info. Nowadays bloggers publish only about gossip and net stuff and this is actually frustrating. A good blog with interesting content, this is what I need. Thank you for making this site, and I will be visiting again. Do you do newsletters by email? Hey there. I discovered your site by way of Google whilst searching for a related topic, your site got here up. It appears good. I have bookmarked it in my google bookmarks to come back then. Hey there. I discovered your blog by way of Google while looking for a related matter, your site got here up. It seems good. I have bookmarked it in my google bookmarks to visit then. Hiya, I am really glad I have found this information. Today bloggers publish just about gossip and internet stuff and this is actually frustrating. A good website with interesting content, that’s what I need. Thank you for making this web-site, and I’ll be visiting again. Do you do newsletters by email? Hiya, I am really glad I’ve found this info. Today bloggers publish just about gossip and web stuff and this is actually irritating. A good site with interesting content, that’s what I need. Thanks for making this website, and I’ll be visiting again. Do you do newsletters by email? Hi there. I discovered your site via Google at the same time as searching for a similar subject, your web site got here up. It looks good. I have bookmarked it in my google bookmarks to come back then. Hello there. I discovered your web site via Google at the same time as searching for a related subject, your website came up. It appears to be good. I’ve bookmarked it in my google bookmarks to come back then. Hiya, I am really glad I have found this info. Today bloggers publish only about gossip and net stuff and this is actually frustrating. A good web site with exciting content, that’s what I need. Thanks for making this web-site, and I will be visiting again. Do you do newsletters by email? Hiya, I’m really glad I’ve found this info. Nowadays bloggers publish just about gossip and internet stuff and this is actually annoying. A good site with interesting content, this is what I need. Thanks for making this website, and I will be visiting again. Do you do newsletters by email? Hiya, I am really glad I’ve found this info. Today bloggers publish just about gossip and net stuff and this is actually annoying. A good blog with exciting content, this is what I need. Thank you for making this web-site, and I’ll be visiting again. Do you do newsletters by email? Hey there. I discovered your blog via Google at the same time as looking for a similar subject, your web site came up. It seems to be great. I have bookmarked it in my google bookmarks to visit then. Hi there. I discovered your website via Google at the same time as searching for a comparable matter, your site got here up. It looks good. I have bookmarked it in my google bookmarks to visit then. Hiya, I am really glad I’ve found this info. Nowadays bloggers publish only about gossip and internet stuff and this is actually frustrating. A good site with interesting content, that is what I need. Thanks for making this site, and I’ll be visiting again. Do you do newsletters by email? Hey there. I discovered your site by way of Google whilst looking for a comparable topic, your web site came up. It appears to be good. I have bookmarked it in my google bookmarks to visit then. Hiya, I’m really glad I have found this information. Today bloggers publish just about gossip and net stuff and this is actually frustrating. A good blog with exciting content, this is what I need. Thank you for making this web-site, and I will be visiting again. Do you do newsletters by email? Hello there. I discovered your website by the use of Google at the same time as searching for a comparable matter, your site came up. It seems to be great. I’ve bookmarked it in my google bookmarks to visit then. Hiya, I’m really glad I have found this information. Nowadays bloggers publish just about gossip and net stuff and this is really frustrating. A good website with interesting content, that is what I need. Thanks for making this website, and I will be visiting again. Do you do newsletters by email? Hiya, I’m really glad I have found this info. Today bloggers publish only about gossip and net stuff and this is really frustrating. A good web site with exciting content, this is what I need. Thank you for making this web-site, and I will be visiting again. Do you do newsletters by email? Hiya, I’m really glad I’ve found this info. Nowadays bloggers publish just about gossip and net stuff and this is actually frustrating. A good site with exciting content, this is what I need. Thanks for making this web-site, and I’ll be visiting again. Do you do newsletters by email? Hiya, I’m really glad I have found this info. Nowadays bloggers publish only about gossip and web stuff and this is really annoying. A good website with interesting content, that is what I need. Thank you for making this web-site, and I will be visiting again. Do you do newsletters by email?